Despite being legally blind, a Guelph, Ont., woman got to see her son Aksel soon after his birth because of a special device - an experience that allowed her and her husband to bond and fall 'in love' with him. 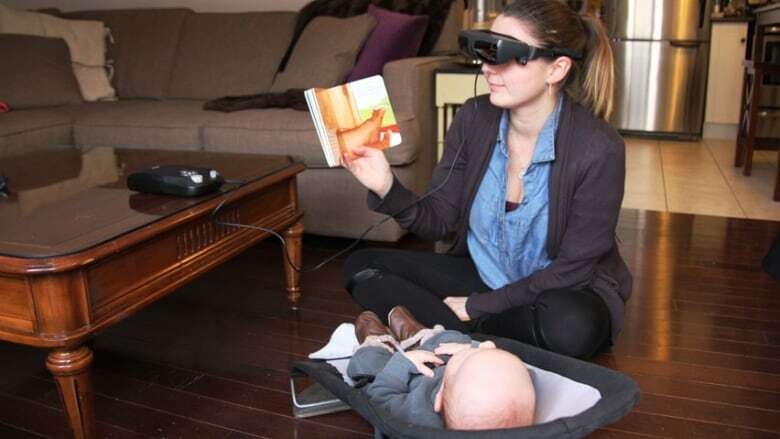 A specialized piece of eyewear gave a legally blind woman from Guelph, Ont., the opportunity to do something that new parents may take granted — see her baby hours after his birth. Kathy Beitz, 29, was diagnosed with Stargardt disease, a genetic condition that causes macular degeneration, when she was 11. While she now has some peripheral vision, she developed a blind spot in the centre of her field of vision and is legally blind. But she has had a big change in her life since using a device produced by the firm eSight, highlighted by the moment she first saw Aksel, who is now a few weeks old. "The moment I got the glasses, I was very ready to put them on," said Beitz. “I got to see that he had my husband’s feet and toes, and I got to see that he had my lips. "My husband and I got to have the family experience of looking at our brand new baby, and bonding with him and falling in love with him." The eSight device is equipped with a video camera that sits over the bridge of the wearer’s nose. The images captured from the camera are enhanced and projected onto high definition screens in front of the eyes. "Their eyes actually perceive more when they look at the screen than they can with their natural eyesight," said Taylor West, a spokesman for eSight, a firm with offices in Ottawa and Toronto. While the device won't help people who have no vision, it can be customized to suit a variety of eye impairments, West said. A user can adjust contrast, brightness and shadow depending on his or her preferences. "I see better in lower lights," said Beitz. "And so I use a higher contrast with white on black." The device, launched in 2013, sells for $15,000. The company has a fundraising department that helps people purchase the eyewear. Those efforts include helping people with crowdfunding efforts, grant applications and a new campaign centred on Beitz's story, dubbed #MakeBlindnessHistory. ESight also says it has started work to try to get the product covered by the Ontario Health Insurance Plan (OHIP). Beitz still has to pay for her device, an endeavour that her older sister, Yvonne Felix, who also works for eSight, is helping her with. "I’ve been working towards fundraising for the eyewear so that she [wouldn't have to] go without seeing her first born’s face, and miss out on that experience,” said Felix, a fundraising co-ordinator for eSight. Felix, who also has Stargardts and uses the eyewear, introduced Beitz to the device. "Being a person with a disability [who has] two children of her own, she knew the struggles of being a legally blind or blind parent. So she was very adamant [about getting] the glasses for me and work with me to use them, so when I did have him, I got to experience everything that she didn't," said Beitz. "When I knew I was getting the glasses, I got very excited. I knew then I would be able to read books to the baby and be a part of that experience ... it gave a huge independence to my parenting skills." According to the CNIB, legally blind is defined as worse than or equal to 20/200 vision with correction – a legally blind person six metres in front of an eye chart sees what a person with normal vision sees at 60 metres. In Canada, vision worse than 20/50 with correction disqualifies people from obtaining a driver's licence or restricts driving to daytime only. There are about half a million people in Canada living with significant vision loss, the Canadian National Institute for the Blind (CNIB) estimates.